Enter Paul Andrew for Salvatore Ferragamo. The newly appointed Creative Director shares his first campaign for the Italian fashion house for Autumn Winter 2018. 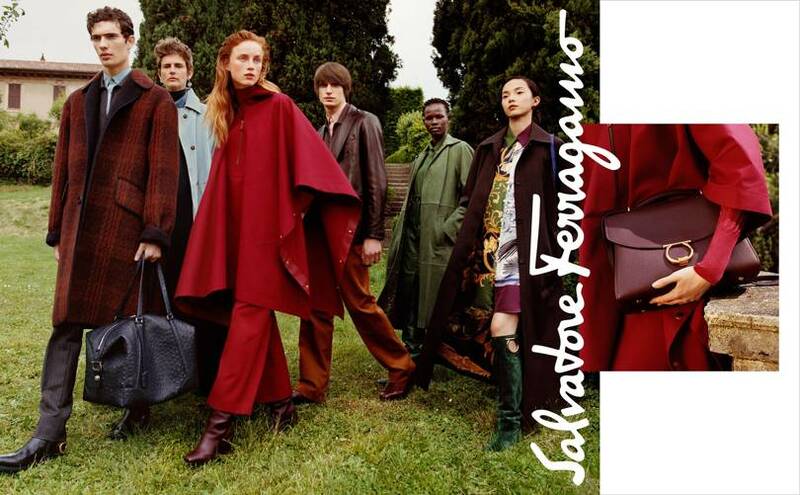 “Together we’ve found a harmony that truly reflects the bold and positive change that’s afoot at Salvatore Ferragamo” says Creative Director Paul Andrew about his partnership with Menswear Design Director Guillaume Meilland. In a recent interview with frontrowedit.co.uk, Andrew said he was “grateful for the confidence and trust of the Ferragamo family and executive committee’ and delving through the archives of the Florence based headquarters, the designer noted that “the archives are an amazing treasure trove of codes on which this brand is founded: masculine/feminine combinations, rainbow color palettes, artisanal mastered textures and newly reimagined and repurposed materials.” The collection came to life on the February runway as a part of Milan Fashion Week. This entry was posted in Ad Campaigns and tagged Guillaume Meilland, Paul Andrew, Salvatore Ferragamo. Bookmark the permalink.